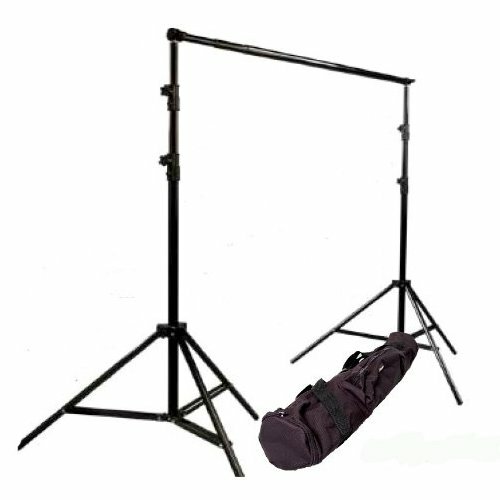 The 901 backdrop support system is heavy duty and suitable for holding all types and sizes of backdrops. It is useful both in the studio and on location due to its compact travel size and ease of setup. Making adjustments to the height and width is simple. The black finish is durable and professional. Height is adjustable from 4ft to 8ft 6in; Maximum width is 10ft; Cross bar consists of four sections, making it simple to adjust the width 5/8" female sockets at each end of the cross bar, allowing you to use the cross bar on any light stand; Light stands use quick single action locks, providing fast precision height adjustment; Light stand footprints are wide to provide extra stability; Holds muslin, paper, or canvas; Disassembles quickly and easily to fit into its carry case; Case is made from heavy duty material, with pockets to fit the components of the background support; 1 year warranty.